In this article we report electronic absorption spectra of silver nanoparticles prepared by reducing silver nitrate in N,N-dimethylformamide in the presence of ferrocene by microwave (MW) assisted method. The surface plasmon band of silver nanoparticles has shown red shift, whereas the band due to silver ions has shown blue shift, with increasing concentration of ferrocene. Time-dependent spectra have indicated red shift of the surface plasmon band with increasing time of observation confirming growth of silver nanoparticles with lapse of time. 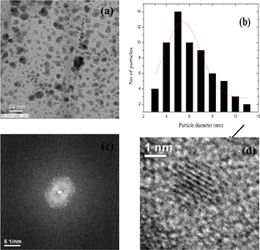 The observed results have been discussed considering the role of ferrocene and MW heating time on the growth of silver nanoparticles.